Beyond Blush: MAKE UP FOR EVER Remix Tour Hits Toronto! MAKE UP FOR EVER Remix Tour Hits Toronto! MAKE UP FOR EVER is on a mission to help us girls organize our makeup bags! Their team will answer any questions you have about products that you are unsure how to use properly. We all have those products that we bought on a whim, unsure of their true purpose. MUFE's artists are here to help! And no, they won't limit their help to only MAKE UP FOR EVER products, you can ask about any brand! MAKE UP FOR EVER announced a partnership with actress Christina Ricci. The Parisian luxury brand has tapped Ricci to design a limited-edition MAKE UP FOR EVER Remix Make Up Bag that will debut on February 1st at the MAKE UP FOR EVER Make Up Bag Remix tour’s first stop in Los Angeles. Created for the beauty maven-on-the-go, Ricci’s MAKE UP FOR EVER Remix Make Up Bag will feature black faux leather adorned with gunmetal studs, metallic silk screening, and a geometric motif that highlights the brand’s signature red lip – a personal favorite for Ricci. Inside, a hidden pocket is the perfect size to tuck away MAKE UP FOR EVER’s new Pro Finish, a multi-use compact foundation with a patent-pending formula that can be applied wet or dry for buildable coverage and a customized finish. Ricci, a long-time fan of the brand, worked closely with the MAKE UP FOR EVER team to design a bag that would blend fashion and function. Inspired by her own edgy-chic flair and fast-paced lifestyle, Ricci’s MAKE UP FOR EVER Remix Make Up Bag is ideal for toting daily must-have products to stay fresh-faced on the run. 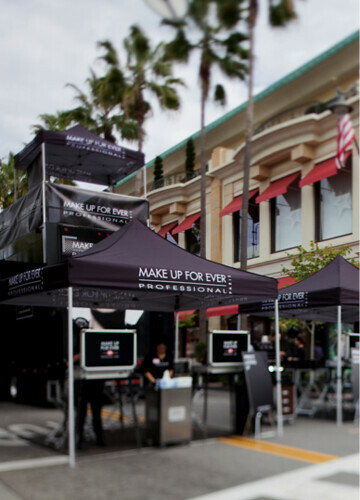 The MAKE UP FOR EVER Make Up Bag Remix tour hits the road next month in Los Angeles and will travel to nine cities across North America through April 2013. The global brand coveted by top industry artists will aim to educate to consumers in an engaging way at their mobile Make Up School, teaching them how to actually do their own make up, not just have it applied. As part of the Make Up Bag Remix concept, MAKE UP FOR EVER’s team of professional artists will take a look inside consumers’ make up bags and teach them how to properly use what they already own, regardless of the brand. The "Make Up Bag Remix" experience is taking place at the Yorkdale Shopping Mall parking lot on Saturday April 13th (12:00pm-8:00pm) and Sunday April 14th (11:00am-7:00pm). Spots are filling up quickly, so book your appointment now at http://makeupbagremix.com.